Our scientists are at the bench daily to produce and validate our antibodies, so they have hands-on experience and knowledge of each antibody’s performance. FastScan ELISA kits let you move through research and discovery phases faster. We’ve identified optimal antibody pairs and done the assay development and validation up front to make sure your results are accurate across the lifetime of your discovery project – from target validation through preclinical phases. 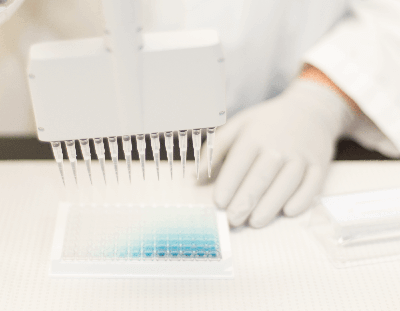 Our ready-to-go kits use a simple protocol that easily integrates into your current processes and budget, streamlines assay transfer, and lets you detect targets in as little as 90 minutes. Single-wash assay protocol reduces hands-on time and assay complexity. In-house CST testing processes make sure results are reproducible across lots and users. Validated for specificity and accuracy across biological sample types. Integrated controls ensure assay performance. Check out the current FastScan kit lineup. We’ll be adding new kits on a regular basis, so if you don’t see what you’re looking for now, check back soon! FastScan ELISA kits are similar in performance, sensitivity, and dynamic range as traditional ELISA but use solution-based sandwich ELISA method with fewer steps for faster time to results. Our PathScan ELISA kits are based on the traditional solid-phase, sandwich-based ELISA method. Compare kits. FastScan ELISAs use a less complex, solution-based assay format with fewer overall steps, so time to results are much faster compared to conventional protocols. You’ll also get consistent results across biological sample types, with sensitivity that’s comparable or better than traditional sandwich ELISA. 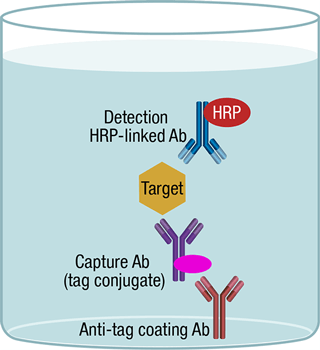 Sample “target” is incubated with a capture antibody conjugated with a proprietary tag and a second detection antibody linked to horse radish peroxidase (HRP). The entire complex is immobilized to a microwell via an anti-tag antibody. Wells are washed, followed by enzymatic reaction and readout of target analyte quantity by colorimetric detection. 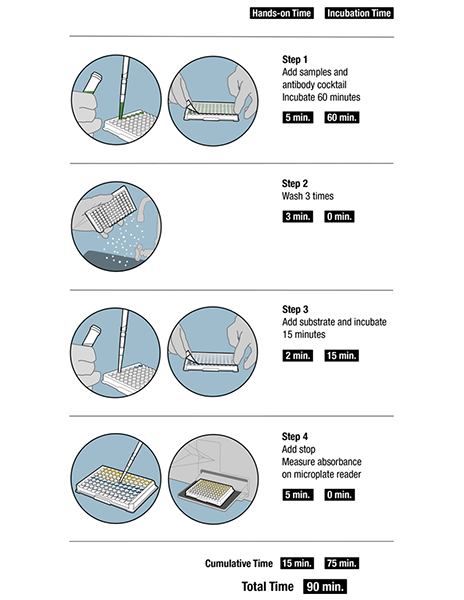 The simple protocol cuts your hands-on time in half and incubation times down by 3X. The whole process only takes 90 minutes, so you have the results you need quickly. CST scientists preselect antibody pairs based on their optimal activity in solution-phase ELISA. FastScan ELISA kits, along with the recombinant antibodies and reagents that come in each kit, are also developed, produced, and rigorously validated in-house. So you can be absolutely certain of accuracy, lot-to-lot reproducibility, and consistency of results between users and sample types. Assay demonstrating typical inter- and intra-plate reproducibility. The reproducibility of lysate protein titrations was determined across 3 plates, with 12 replicate titration curves per plate (36 total titration curves). Shown (left panel) is the relationship between lysate protein concentration from RB-positive Jurkat cells and absorbance using the FastScan™ Total Rb ELISA Kit #23595. The intra-plate CVs (right panel) were found to be <5%, as was the inter-plate CV. Data were calculated off a point from the middle of the titration curve, with 12 data replicates per plate or 36 replicates across 3 plates. These data are representative of the intra- and inter-plate consistency of the FastScan™ ELISA kits. Assay demonstrating typical inter- and intra-plate reproducibility. The reproducibility of lysate protein titrations was determined across 3 plates, with 12 replicate titration curves per plate (36 total titration curves). Shown (left panel) is the relationship between lysate protein concentration from RB-positive Jurkat cells and absorbance using the FastScan™ Total Rb ELISA Kit #23595. The intra-plate CVs (right panel) were found to be <5%, as was the inter-plate CV. Data were calculated off a point from the middle of the titration curve, with 12 data replicates per plate or 36 replicates across 3 plates. These data are representative of the intra- and inter-plate consistency of the FastScan™ ELISA kits. FastScan ELISA kits – come with everything you need for 96 tests to start running assays, and kits are available for both phosphorylation-specific and total protein options. Bulk packaging – available upon request. 384-well format may also be available on a kit-by-kit basis. For more information or to order, please contact CST's sales department for processing time and pricing.